Behlen B102-8000 - Vinyl Sealer 13 oz. This item has been replaced by the T31486. This sealer develops an excellent moisture barrier for the wood substrate, while providing a good base for all Behlen lacquer finishes. 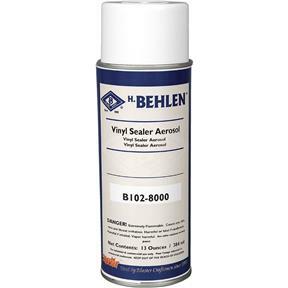 Vinyl Sealer Aerosol is a flexible, high solids, moisture resistant, clear sealer with good atomization that lays a perfect foundation for Stringed Instrument Lacquer. But thats not all. Its also a great sealer for any Behlen topcoat whether being used for spot repairs or complete finishing. Used in conjunction with pre-catalyzed lacquer aerosols, the combination creates a moisture resistant finish suitable for spot repairs on kitchen cabinets. 13 fl. oz.